Moving on, on Bailii this morning I came across what to my knowledge is the first reported case where a child arrangements order was made. H v F (Relocation) concluded with Mr Justice Peter Jackson making a child arrangements order in favour of the mother (the relocation aspect being due to the fact that she intended to return to her native New Zealand). Free DNA tests piloted in family courts to clear up paternity disputes - An about-face by Justice Minister Simon Hughes, who has realised the obvious problems caused by legal aid no longer being available for DNA tests. Call for MIAMs to be free following ‘embarrassing’ Government figures - Government figures show a collapse in the number of people using mediation in the past 12 months, following the cuts in legal aid introduced in April 2013. National Family Mediation suggest a way to reverse the trend. Legal aid funding in family cases drops 60% year on year, according to report - Those same figures show the obvious result of the cuts. No prizes for spotting the common theme in those three stories. B (A Child): The limits of the court’s powers - A look at the child abduction case B (A Child). 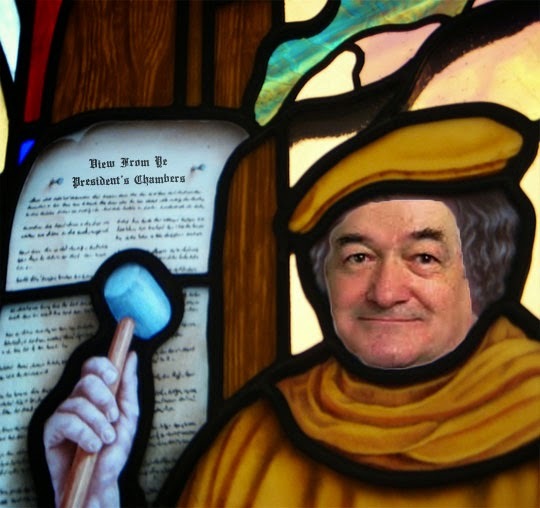 Important cases: Mesher v Mesher - A look back at Mesher v Mesher and Hall. Spare a thought for the judges - The connection between the cases Re Z (Children) and London Borough of Waltham Forest v AD. The reality of self-representation - I try to put myself in the position of a LiP. With that, I will bid you a good weekend. With a slightly different title to reflect the existence of the new Family Court, this is the second edition of Lucy Reed's guide to self-representation in family matters. You can find my review of the first edition here. As will be seen, the book updates the law, including all of the changes that took place last April. It also provides more information regarding alternatives to court proceedings. As a result, as Lucy points out, the book has increased in size, as is the way with all new editions of legal textbooks. 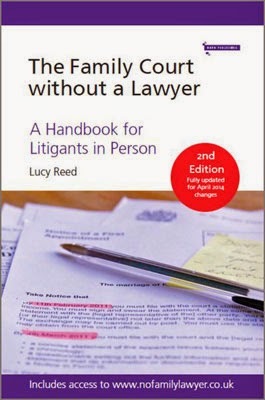 The book also now boasts a foreword, written by Mr Justice Cobb, who points out that the book is not just for litigants in person, but is also for their families and for their McKenzie Friends (in fact, I can imagine this being a general handbook for all McKenzie Friends involved in family law work). It is even a useful handbook, he says, for those who have representation. I agree with him on all points. 1. Understanding The System - including chapters on the courts, lawyers and support, and where to find the law. 2. Putting It Into Practice - including what to expect at court, general procedure, evidence and a chapter on running your case. 3. Divorce, Separation & Finances - the law and procedure on these areas, including a chapter on finances for separating cohabitees. 4. Children - the law and procedure in matters concerning children, including chapters on child abduction and children cases for non-parents. 5. Domestic Violence & Abuse - the law and procedure on domestic violence. 6. After Judgment - including enforcement, costs and appeals. 7. Toolkit & Resources - including a glossary, a list of internet resources, a table of cases, precedent forms and templates (with working versions of many available to download from the book's accompanying website, www.nofamilylawyer.co.uk) and extracts from rules and statutes. As one might imagine, the main updates are to Part 1 in respect of the family court, legal aid (I understand the book was actually revised in March last year to accommodate the legal aid changes then) and sources of help, and to Part 4, covering the changes in respect of children law and procedure, including the new child arrangements orders and the CAP. For example, the chapter in Part 1 on lawyers and sources of support now includes sections detailing those situations for which legal aid is still available and a short section on mediation providers. The new sections are written in the same accessible but authoritative style as before. There are also some updates elsewhere, such as a new section on legal services orders and maintenance pending suit in the chapter on finances for divorcing couples or civil partners. Apart from those updates (which are substantial), I noticed some re-writing of chapters or parts of chapters (such as the chapter on cases involving domestic violence and abuse), although it would take too long to compare editions for me to say just how much has been re-written. With that proviso, much of the book does not appear to have changed, and that is not necessarily a bad thing. One small criticism I had previously was of the layout of the book. This has improved, for example with better fonts in places, and the feel of the book has improved, although I'm not entirely sure why - different paper and/or printing process, perhaps? There is, of course, even more need for a book such as this since the abolition of legal aid for most private law family matters last year. Any assistance that litigants in person can find is welcome, but finding general advice as useful and reliable as this is pure gold. If you are in the unfortunate position of having to represent yourself in the Family Court, then you simply cannot do better than obtain a copy of this book, which you can do from the book's website, mentioned above, or from Amazon, including a Kindle edition. As the cliché goes, it's not the despair but the hope that kills you. No, I'm not referring to the latest shambolic showing by our shower of over-paid ball-kickers, but rather to the reform of the our family justice laws. So much is in need of updating, such as bringing in no-fault divorce and giving property rights to cohabitants. In both cases we have had our hopes raised by parliamentary initiatives, only to have them dashed by parliamentary incompetence and indecision. Well, Baroness Deech is obviously not prepared to sit on the bench and wait for government to act. She has introduced her own private members' bill aimed at reforming the law on finances and divorce. Her Divorce (Financial Provision) Bill is the subject of my Wednesday post on Marilyn Stowe's Family Law & Divorce Blog. The recent case of A (A Child) was apparently described by Mr Justice Moylan as the longest dispute of its kind that he had encountered during his years as a judge and barrister. In my post on Tuesday I set out some of my thoughts on when children disputes go wrong. Lastly, I have finally gotten around to doing something I have been wanting to do for a long while: writing an occasional series of posts about important family law cases of the past. I kicked off the series on Monday with a post on Wachtel v Wachtel and followed this up yesterday with another, featuring Richards v Richards. And with that another season week comes to an end or, to put it another way, they thought it was all over... and they were right. Or something. Sign the save legal aid to protect access to justice for all petition here. Just after my last post, in which I suggested that it was a slow news week, a couple of news stories and cases popped up to prove me wrong. I will mention here one story and one case. Clearly, what family lawyers need most is more guidance. Without it, they have obviously been stumbling around in the dark, with nothing more than statute, case law, statutory instruments, rules, practice directions and text books to point them in the right direction. The latest person to step in to fulfil that need is Mr Justice Mostyn, who has produced guidance on standards for financial remedy financial hearings before a High Court judge. Rush over to Family Law to get your copy. "It is, in my opinion, important that the judgments published are not restricted to those handed down in cases of complexity or where there is some notable or unusual feature or where the court makes criticism of social workers or other professionals. There are many other cases, of which this case is one, which are illustrative of high quality and sympathetic social work practice, of local authorities working in partnership with families to try to support them in caring for their children. In my respectful opinion, cases in which there is evidence of good practice leading to positive outcomes for children and families are just as newsworthy as those which are more problematic." It would be nice to think that this might be picked up by the media, but alas I doubt it will. Child maintenance and school fees - In which I discussed the Upper Tribunal case MR v (1) Secretary of State, (2) CR (CSM) (Child support : other). Legal aid cuts have created a two-tier system, and mediation is not the answer - Which came out of this story in The Independent. I never had the Latin - Talking about how Latin phrases are still part of the legal jargon. Also an excellent excuse to link to Peter Cook's wonderful Miner sketch! Litigants in person causing delays - A follow-up to the legal aid cuts post, above. Once again, have a good weekend. You can always tell it's a slow news week when national newspapers run stories emanating from 'leading lawyers', usually about some terribly interesting new phenomenon they have come across. Of course, the motivation of said lawyers is to inform the public and not at all to whore a bit of free publicity. Anyway, this is one such week, and I will leave it to you to decide what story or stories I am referring to. A Father v SBC & Ors - A case that I tweeted about yesterday, and that Andrew Pack has covered with his usual panache over on suesspiciousminds. Apparently, a consequence of the drive to reduce the time taken to complete care proceedings is that there has been an increase in the numbers of care cases being concluded with a final care order on the basis of the child remaining at home. If this is so, there will inevitably be an increase in the number of cases where the local authority concludes that a child should subsequently be removed. Mr Justice Baker gives guidance (at paragraph 49), approved by the President, for dealing with such cases. The case also highlights the nonsense that whilst parents in care proceedings get automatic public funding, where, as here, the local authority proposes the removal of a child living at home under a care order and the parents apply to discharge that order and for an interim injunction under s.8 HRA, they are not automatically entitled to legal aid, despite facing an equally draconian outcome. B v B - Which concerned a father's application for the summary return of his daughter to Lithuania. Mr Justice Mostyn ordered such a return, but interpreted the term 'forthwith' in Article 12 of the Hague Convention to mean 'within three weeks'. He also made an order prohibiting the father from approaching within 100 metres of the mother's flat in Lithuania. As Sanchia Berg questioned on Twitter, quite how such an order is to be enforced is not entirely clear - presumably the court in Lithuania will be able to enforce it, if it does not make a similar order itself in any event. Firstly, Lucy Reed over on Pink Tape has come up with the interesting proposal of a not for profit organisation providing reporting of family law cases for the public. Lucy is happy to receive comments, criticisms or contributions. For details, see this post. Secondly, Marilyn Stowe has put out a call for examples of the difficulties faced by people no longer able to get legal aid, in connection with a television programme investigating the human impact of the UK Government’s decision to cut its legal aid budget. If you think you can help, contact Marilyn. Finally, I was gratified to note that my @familylaw Twitter feed recently passed 9000 followers. 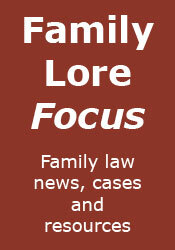 If you are not already one of them, @familylaw feeds all news items, cases and articles from Family Lore Focus on to Twitter, thereby providing a convenient way to stay up to date. I may be back tomorrow, but if not, have a good weekend.